Prepping for the "Mommy Experience"
September 30, 2007 - For those of you who don’t know, I’m expecting our first baby (featured right) in two weeks. I’m feeling a bit like a stuffed goose, and hurrying trying to tie up loose ends before our son arrives. I haven’t written much as I've been dealing with insomnia, fatigue and juggling multiple projects. Of course, the queue of ideas and thoughts is full…and I’ve had no time to get anything out in the form of an article. ...Maybe post-baby? Don’t laugh - I'm enjoying my denial and convinced I have the ability to multi-task! Brick and Mortar Stores like Macy’s, Kohl’s, JC Penney and even Gymboree boutiques – Hear our cry! If your aisles are too narrow for women shopping with a large belly to fit through without knocking stuff off the racks --- OR for women pushing a stroller with a grabby infant, you are losing sales! Get a clue – create space for us and you’ll create space for sales! Grocery Stores It confounds me as to why you offer only a single "token" "new and expecting mother" parking space!? I mean, it's a nice gesture, but do you really think that there will be only one of us, out of the 250 others parking in your lot? Perhaps it would be good for us to be granted temporary handicap badges when we're 7 months pregnant, which will expire on baby's one year birth date so we can use the litany of handicap spaces. While that's not likely to happen, couldn't you offer 2-3 pregnant and expecting mommy spaces for us? Especially in freezing cold and icy climates!! Children’s Place –We got a fat gift certificate to use for baby clothes only to find out that Children’s Place doesn’t take them online. What’s worse, my local store didn't have my online items in stock and couldn't order them for some reason. The online customer service people told me the best thing to do was to purchase the items with another method of payment, wait for shipment, then drive to the store, return the item and repurchase it on the gift card. Classic experience hurdle: Make me pay for shipping, then drive to the mall to take care of this when I may deliver any day. Silly! Catch up with the times – most online stores take gift cards today, and harried mommies (AND expectant moms) can’t always make it to the mall . Gymboree – I picked out a few cute outfits online today, while I was in the middle of shopping at the Children’s Place. Not 15 minutes after I got off the phone with Children’s Place, I went back to my shopping cart on Gymboree, and my visit had timed out (expired) – and so did my shopping cart! As a result, I lost the special sale purchases I’d so carefully looked for. Web statistics reflect that many online shoppers multitask when browsing online…and it’s time for Gymboree to catch on to this trend! Shopping carts should dynamically represent inventory available (so if I come back, and my product is no longer in stock, it tells me apologetically). They should also time out after a LONG period of time (varies from 12-24 hours usually, although Gap and Old Navy seem to last for about a week). You lost my sale on principle alone! Target – In general I have problems with the online experience at Target.com, which I may do a future “Experience File” on. In short, the entire online store forces the consumer to hit back buttons repeatedly, because there is consistent “loss of state” as people select various categories and shop by type or brand. The site would also benefit from some Web 2.0 features that could make the experience much more streamlined for individuals adding items to cart or a registry list, among other things. While I shop Target online a lot, my professional opinion is that the site has severe experience limitations imposed by its catalog provider that push the user experience behind the times - by at least three years. Specific to mommy stuff at Target– I have been a user of Target Gift registries (wedding registry AND baby registry within 18 months) and I’ve been frustrated! Why can't I prioritize the items I select for my guests? Further, I can’t add notes to items for the benefit of my fellow shoppers. Also, when I update my registry in the store using the hand scanner, photos of the items I select NEVER show up online (even if there’s an online version of it). This makes the shopping experience difficult for others, as well as they must rely on SKU numbers. Take the target lists experience to the next level, and consider the context of the users participating in gift registries! Improve this experience and improve sales! Amazon.com Generally the best experience overall, although I do believe the site could benefit from some more dynamic Web 2.0 features that make adding items to a registry and viewing related items a better experience. When a user adds items to lists, pages load with "other recommendations" which are often not useful. This requires the user to do a lot of “back buttoning" to get to a desired place. Other than that, my gripe is with the Amazon/Target registry situation. I just don’t understand why, when Amazon features the Target gift registry, there is no synchronization between items on my Amazon registry and my Target registry. Either make the Target and Amazon gift registries integrated, or keep them separate! Having partial integration is just confusing. I won't even go into the challenges I experienced while trying to find maternity pants that do not fall down ... or the joys of finding "belly bands" to keep your pants up! That seems endemic to the plight of the maternally challenged woman today. I will say KUDOS, however, to Gap and Old Navy for offering GREAT maternity clothing with a wide range of sizes and fast delivery! It has been a godsend! Well, I’m sure there’s more to say, but this is enough for one day’s shopping. 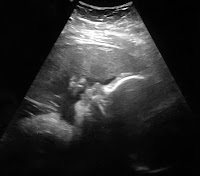 I’m off to have yet another sonogram! More soon! In case you missed it, there's a lot of talk about the embarrassing outage of Whole Foods CEO, John Mackey, covertly posting on web and investment blogs. Fellow contributor, David Reich opens the door for some good commentary on the subject here. As a Whole Foods fan, I'm just disappointed. As Ann Handley points out in her comments, you'd think a company that promotes the idea of "real" food would have executives that are equally "real." As experience evangelist, I promote the idea that great brands can stand on their own. Beyond the legal ramifications of this... I wonder if we'll begin now to uncover other trends like in companies we know and love? My brain is full of posts. However, it seems the longest distance these days is between my head and the keyboard. For the past few months, I've been very heads down managing the strategy for a portal integration project for a B2B company in the high tech space. It's a complex company, with a complex audience and complex products.... and untangling that all to create something simple has been the challenge for our team. So that's why I just haven't been able to extricate myself long enough to post, or read much. Amazing how easy it is to fall behind. Last month, however, at the request of my friend Kelly Goto, I did take the time to pen one article she asked me for. The article is a personal story that runs parallel to Kelly's new gotoreport issue dedicated to the topic of becoming "UNSTUCK". The series primarily focuses on companies making the transition from Web 1.0 to 2.0. Recently, Kelly and I played a good amount of "brain tennis" on the "STUCK" issue. As we chatted, we continue to marvel at how "STUCK" most companies -- or most individuals truly are. It happens to us, too. Whether we get mired in old legacy systems while moving to Web 2.0, or stuck in a culture that can't effectively innovate, implementing new models for customer-centric commerce.... or loosing ourselves to create a new, satisfying professional or personal lives...lots of us live stuck. The article in this month's gotoreport is my personal story of becoming unstuck. Rather than post it here, I thought I'd link you over . While you're there, check out the other terrific articles on Web Usability, Design, and moving into a Web 2.0 development environment. Smart companies have customer service policies in place to protect their best interests and the bottom line. Smarter companies, however, know how and when to bend certain policies for customers who have the right profitability, loyalty, frequency of purchase and long-term revenue potential. This helps protect customer loyalty and works to maximize the bottom line. The challenge in today's market, however, is institutionalizing a system wherein each employee understands customer centricity - and the right employees are adept in exercising flexibility with appropriate boundaries. Databases, systems and policies are critical tools. Executing based on the knowledge gathered by companies is another thing entirely. Beyond loyalty programs, when it comes to appropriately recognizing customers in the service arena, most companies fall short. This is why customers losing out on good service have little choice but to become more vocal and tenacious. I went to Best buy to accomplish two things: First, I needed to return an extra power source I'd purchased for my laptop. The associate who helped me had sold me the wrong model. The kicker was, I didn't realize it was the wrong adaptor for three months because while I had purchased the smaller model for a trip to Europe, I had forgotten to bring it with me. When I finally took it out of the package and realized the extra $90 power source was useless to me, it seemed worth trying to return. Second, I was with my sister-in-law, Leah, who was ready to buy a new laptop with my assistance. We trolled the computer department first, and I left Leah to play with the model I had recommended. I then approached the customer service desk to return the power source. When my turn came, I made my case and, as I suspected, “Dulleye” expertly spouted the 30 day return policy to me. I thanked him and asked for his supervisor. After a long wait, an eye-rolling supervisor approached, and the two huddled with briefly before he approached me. It's enough to say that both "Dulleye" and "Eyeroller" expertly spouted "policy" to me. After explaining for the second time that 1) The packaging was intact; 2) The item had not been used, and 3) the exact model was still being sold on the shelves, I said in an exasperated tone "Look, YOU guys are the one who sold me this power source -and it's the wrong one!" "Does it help to know that I've purchased FOUR laptops at Best Buy this year alone? I've actually come to purchase another one today, and I'd hate to take that sale to another store because I'm short on time. What do we need to do to make this right?" After another wait, I asked for the store manager. I watched as “Eye Roller” explained my situation to the store manager, shaking his head vehemently to indicate that Best Buy should not refund the money. So far, about 20 minutes had elapsed. Hope sparked as the store manager walked over to me with eye contact and a hesitant smile. I repeated my plight to him. I explained that I would love to exchange the power supply for the right product, but they didn't happen to sell one. I was fine with store credit and it only made sense. He wasn't quite convinced. "I understand you've got policies for a reason. In fact, I write, speak and teach about customer service for a living. Because of this, I also understand that Best Buy is flexible with its policies for good customers. I'm a good customer. In fact, it may help your decision to know that in Best Buy's profiling schema, I am considered a "JILL" and I carry a profitability level of four out of five. I understand this means that you guys should want to keep me as a customer at this store." This is where the store manager got the nickname "Wide Eyes." I continued with a pleasant smile. "Now, Jeff over there (pointing to our Geek Squad computer sales rep, Jeff as he waved) is helping me and my sister-in-law with my fifth laptop purchase of 2006. So, can we return this cable now, or do I need to head for another store?" The store credit was issued immediately. We bought another laptop that day, too. Now, I was fortunate enough to have been previously shown my entire Best Buy purchasing history, demographic profile and profitability number in an interview with a Best Buy executive several months before. She had explained to me congruently how someone with a profile like mine would (hypothetically) be handled in a return policy decision. The same executive had also described how hard it was to get her staff to understand the simple categorizations to make exceptions to the rules on a case-by-case basis. I'm glad I had that knowledge in my back pocket – but ultimately all of this serves to make a point. I’ve written a bit about Best Buy in the past. In short, what's great about Best Buy's system is that it maps customers to persona-based profiles that help associates understand the type of customer they are dealing with. It also assigns a simple profitability scoring scale from 1-5 (5 being the best). This should make it super easy for any associate to quickly grasp the value of a customer without doing a detailed analysis on purchase history. … The problem is getting people to use this knowledge. I went through three people to get Best Buy to treat me like a "Jill" with a profitability multiple of four. And all three had access to my profile. Not one of them looked at that information – despite my earlier pleas. 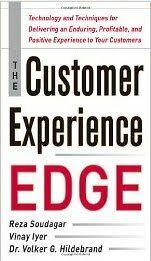 The truth is, it just takes time to operationalize a flexible customer service framework. A myriad of factors weigh in, including training, turnover, management preferences, staff maturity, common sense, level of experience and individual store policies. Over time, it should only get easier for Best Buy to properly train customer service associates to review a customer's profile, understand their value and to take action that is fiscally responsible and that meets the customer's requirements to remain loyal. The visibility created by the internet, social networks and sites like "You Tube" are creating popular outlets for wronged and vocal customers. The exposure risk companies now face will only create more impetus for them to get customer service right the first time – and to invest in appropriately flexible customer service management policies and procedures. I had an experience this week that serves as a great follow up to my previous article on scent marketing. Right now, I'm in San Francisco. I have been staying at the Four Points by Sheraton at the SFO Airport and commuting between downtown and San Jose. Upon entering my hotel, I immediately noticed the scent of pie wafting from the lobby. In fact, the was pervasive in every corridor, inside my room, even outside the hotel and it didn't take long to suspect scent technology at work. But first, I had to ask if they had pie at the restaurant. The waiter answered "only sometimes." Interested in how this related to the scent technology use, I inquired about the scent with the manager. He reluctantly admitted that Four Points is using scent technology to create a more home-like and welcoming atmosphere. When I learned they had no pie, I then felt cheated! The smell eventually became annoying - especially when I was not hungry. You know how you feel after you've eaten and the smell of your empty plate or leftovers turns you off? Yech. The smell, combined with the stainless steel cleaner they used in the elevator, created a smell similar to that of VOMIT. That's not welcoming at all. Okay, so good for Sheraton for wanting to create a more "home like and welcoming" envorinment. The thing is, this goes to show that a comforting smell itself isn't without some drawbacks. Further, smell alone isn't going to create the home like experience. Walk in and you're immediately confronted with a fancy set of five stairs with a curved facade.... separated by a brass railing. There's no ramp (although there's a lift for handicapped guests). This seems to defy logic since most people checking into a hotel are carrying luggage. Upon entering my King Suite, I was confronted by about 15 more, rather narrow stairs that led to my sleeping loft. All I wanted to do was to find a bathroom and crash for a minute. Instead, I ended up hefting luggage up the steep incline to my sleeping quarters. How about a cold, clammy bath? For some reason, the company insisted on installing SPRINGS on all bathroom doors, which forced them to close behind you. I could not hear the phone or anything going on downstairs from inside the bathroom. I was forced to prop the door open with a trash can so I could listen for the phone and/or knocks from room service. While the curved shower rods around the standard tub created a spacious shower interior, I was dismayed to find a freezing cold bathroom (no heater or controls there) and a shower with really POOR water pressure. Not only was the pressure bad, the water didn't get hot enough, leading to an unsatisfying shower and a freezing exit on to the cold, poorly cleaned travertine floor. This wasn't like home at all!! The hotel boasted bath robes and spa products. My robe was hidden in the back of a closet and went unnoticed for days. I actually used the spa lotion and it was nice -- but my mostly-empty bottle was never replenished for me like they are at other hotels. This felt a bit "cheap" in the end. Why not put out the robe as a welcome and replenish the goodies for the guests? The phones were improperly programmed in my room, making it very difficult to connect to the front desk, housekeeping or room service. The first time I dialed the front desk, I tried three times to get an answer. I got no answer, a hangup call, and then an annoyed response after more than 30 rings. It was only 9:45 pm. Beyond the fact that they pulled a bait and switch on the pie, the hotel's restaurant menu was uncreative and uninspired: Wings, hamburgers, fries, grilled chicken whatever... It was the same travel fare most of us road warriors are completely sick of. If they wanted to make the hotel feel more like home - why not offer home cooked meals, instead of the same, hotel fare you can find anywhere? The point is that customers don't like to go through hoops - we don't have them in our home environment, and we'd rather not have to jump through them at a hotel. In fact, hoops are actually contrary to creating a home-like and welcoming experience. For the marketers that dreamed up this experience: Is the scent of Fresh Baked Pie is going to make me feel positive when so many other aspects of the hotel experience were simply annoying? Did the company do ANY experience testing whatsoever with real customers - travel weary people, families, etc.? Either Four Points is trying to create a more home-like experience that drives brand affinity and loyalty, or it is not. From my experience at this hotel, it looks to me like they built a lot of marketing hype around a hotel experience that may fail to deliver. The question is whether or not what I experienced is a limited set up hiccups related to this hotel only. My husband and I joined the Vonage family last month and I have to say, it’s been good for the most part. The price is good - even for international calling. The service seems to function reliably, although we’ve had to restart our modem a number of times to get things working again after cut-offs - even a few mid-call, which has been inconvenient (buzzz). However, I’m not sure if that’s a result of my ISP or the Vonage service, itself. For those of you who do not have x-ray vision and cannot read the text by the green arrow, it says "I am a robot" in response to my question "You aren't really a person, are you?". Why the Buzz? To make a point. Little usability problems are like pesky “experience gnats” that bother consumer increasingly over time. Sooner or later, the irritation they present may force people somewhere else… and that’s where the risk is for most companies today. This is especially true for a company like Vonage, which has first-mover status in this category, along with a relatively high hurdle to conversion and a seemingly complicated set of service options. This is also especially true for companies in rapid growth modes, which are rapidly developing and launching new products and services to new markets... adjusting messaging and service offerings to maximize conversions along the way. Simply put, clarity and ease of use are critical. Where Vonage has succeeded on many fronts to create an understandable product and achieve market penetration – the risk they face (like many of us) is that someone else will come along, learning at their expense to create something that’s even easier to use. We’ve seen this happen in the market thousands of times. 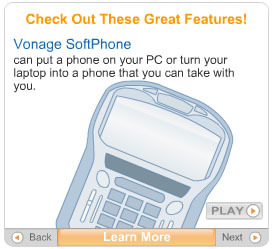 That’s why Vonage – and companies like it – can’t afford to skimp on customer testing! Ironically, some simple user acceptance testing would have registered the glitch in the little service app I noted. 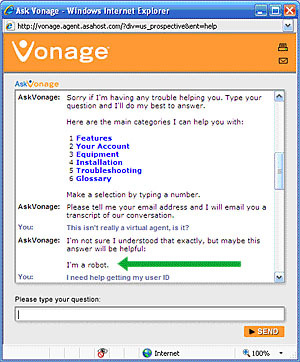 Customer testing may have also identified the perceptional challenges that are created by applying a marketing term like “AGENT” to what equates to a FAQ engine… It may also have uncovered the myriad of simple usability challenges I noted on Vonage's customer targeted web site – as well as the support collateral they sent us when we became new users. Killing the experience gnats is best supported by effective iterative product development lifecycle management. Using the right iterative model, appropriate levels of testing can be “built in” at various stages of work to ensure the end-solution meets the needs of the business, audience and answers market need. Employing appropriate testing approaches across the development lifecycle will help identify areas of the environment may cultivate experience gnats - and elliminate them. Ineffective iterative approaches applies testing at a level that is too shallow or narrow. Testing that fails to go deep enough may fail to uncover functional problems that impact a large number of users. Testing that is limited within a single channel can create experience pitfalls - because each time changes are made, they can have a cascading effect on other areas, including collateral, web experience, site content, service policies and other key experience areas. Poorly executed planning can happen for a number of reasons, including ignorance or poor governance. However it is often present because of (or at least impacted by) insufficient development timelines, development delays, or "executive pushing" due to business pressure. This drives increased pressure for launch and often subverts customer-based testing (e.g. usability testing). Good iterative processes support testing that assesses individual components as well as the overall, cross-channel experience, to ensure the user’s journey comprehensive experience is as clean, "gnat-free" and seamless as possible. This testing is never done - it continues as the products and services evolve over time. It requires time, investment and dedication - and very importantly, executive support. Beyond the gnats, iterative testing may help identify serious customer experience pitfalls. 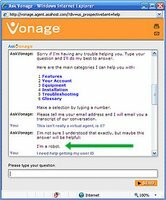 Incidentally, I did get touch with Vonage by phone and reported the little application error, which hopefully by now, they’ve fixed. The associate was affable, responsive and thankful for the report. She was also helpful in resolving my own issue. Her approach and demeanor squashed a few gnats for me and left me feeling generally positive. Ultimately, experience gnats like the ones pointed about above can be encountered with almost any company - so the goal here is not to be nit-picky. Some gnats are bigger than others, as we've pointed out - including self-service usability problems and hidden clauses that screw the customer. Testing can help ensure that, as we architect experiences, we avoid "leaving out rotten apples" that can attract and colonize gnats, and annoy customers. Using the right development methodology, which leverages practical testing to anticipate and correct address potential experience pitfalls that can have a cumulative effect of undermining customer relationships.